Portable welding kits are great for on-the-go torch welding jobs- especially for metal repair work, welding tubes and pipes, or even artwork sculpture. These portable welding kits are essential for mobile service professionals to conduct metal cutting, forming, bending, steel welding as well as brazing and braze-welding. The 12.45 lb. UniWeld portable welding & brazing kit is our top portable welding kit pick- it can weld up to 1-Inch copper tubing and up to 1/8-Inch steel with its brazing tips. 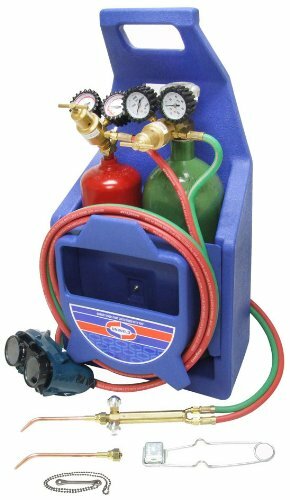 It includes an oxygen regulator, a front valve torch handle, an acetylene regulator, as well as various welding and braze tips. Users like the affordable price; the lightweight design; the solid handle and case; and the Uniweld-construction of the gauges, torch handle and tips. 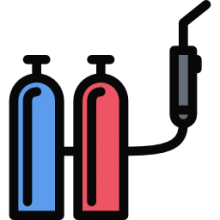 They don't ship with the actual canisters- you'll need to supply those yourself. 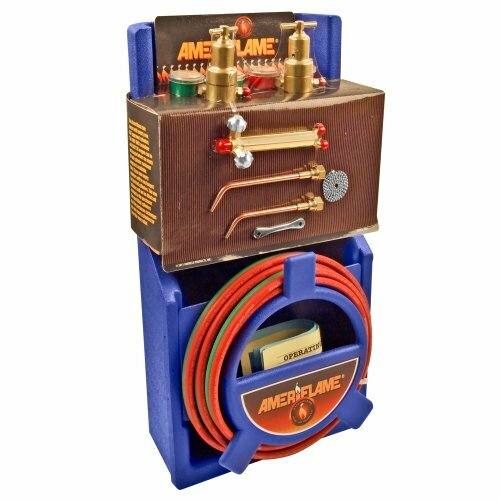 The Ameriflame T100 Medium Duty Portable Welding/Brazing kit is a portable welding torch kit that has some pretty robust features. It is capable of welding up to .125 inches worth of steel as well as braze copper tubing up to 1 inch. 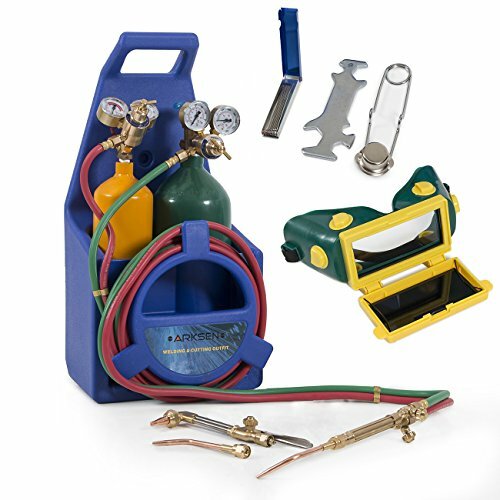 The kit includes safety goggles, an oxygen regulator, an acetylene regulator, a front valve torch handle, a twin hose set, an “A” connection, a flint lighter, a tank key and also includes its own carrying stand, which a lot of users applaud for its toting convenience. Buyers also applaud that this portable welding torch kit is lightweight and is good for commercial heating and ventilation as well as plumbing and air conditioning projects. Reviewers also like the fact that this portable welding torch kit is priced lower than a lot of other options on the market and works just as well as the more expensive ones. Users like the size of this portable welding torch kit because it is ideal for laymen who would prefer to do their own small to medium-sized welding jobs in their own workshops at home. Ships with: A Front Valve Torch Handle, Acetylene Regulator, Oxygen Regulator, Type17-0 and Type17-2 Weld/Braze Tips, safety goggles, 12.5' Twin Hose Set, "A" Connection, Tank Key, Plastic Carrying Stand, Flint Lighter. One downside is that it doesn't ship with the cylinders, but it's users still commend its affordability and robust accessories that include safety goggles, tank key, flint lighter and carrying stand. It's great for HVAC service professionals, home-repair DIY types, and air conditioner repairman- with one user writing that he purchased several of them for his air conditioning technicians to replace their old, leaking units- and was thrilled with the quality and performance he is gotten out of them over time. That said, let's take a look at five of the best-selling portable welding kits on the market today and see how they compare. This victor-style portable torch kit is a pretty solid option for general maintenance work. Users also like it because it is easy to use for auto repair, air conditioning service issues, refrigeration problems and can even be used for art-metal sculpture. Buyers also like that it has a nice waterproof storage compartment for all the smaller parts that ship with this portable welding torch kit- this keeps the smaller pieces all together with less chance of misplacing or even losing them. This portable welder also has a convenient rear entry to the regulators, which gives this portable welding torch kit more balance on smaller cylinders. Other features buyers enjoy are that the welding and cutting torch kit has its own tanks, is functional for a variety of different jobs and projects, has a dedicated storage compartment for small pieces, and that it welds up to 3/16” and cuts up to 1/2”. It also comes with one 4L oxygen cylinder, one 2 L acetylene cylinder, welding goggles, one oxygen and one acetylene regulator, two welding tips, one cutting torch, one twin welding hose, a tip cleaner, one spanner and one spark lighter. There were a variety of users who did not feel that this really is a professional portable welding torch kit and believe that it would not be advisable to use in any kind of professional work setting. They also didn’t like that it didn’t come with any kind of instructions. That said- this is a pretty strong option to consider. This portable welding torch kit by Northern Industrial Welders is a solid medium-duty, victor-style unit. Its buyers applaud its ease of use and its lightweight design. A nice feature is that this portable welding torch kit can cut metal up to four inches thick and it can weld to ½. It also ships with a variety of different tips users can employ on different projects. A lot of buyers also like that the torch handle has two stainless steel needle valves that make the job faster, and has a more accurate flame adjustment making the job that has to be done somewhat easier. This portable welding torch kit also has a carry tote along with a waterproof storage compartment for all the smaller pieces that go with this kit. The main issue that users tend to have with this portable welding torch kit is that it doesn’t come with its own tanks. The Uniweld KC100P welding torch is a professional style portable welding torch kit that not only welds but brazes as well. It has two different welding and brazing tips capable of brazing up to one inch of copper tubing and welding up to 1/8 inch of steel. Users like that the regulators come with protective rubber gauge boots which is a nice protection feature. Also, the front valve welding handle has stainless steel ballpoint valves, which makes for much more accurate gas control when welding or brazing with this portable welding torch kit. The kit also includes its own carrying stand and welding goggles that have flip-up lenses so that users who wear glasses can also wear the goggles without removing their eyewear. 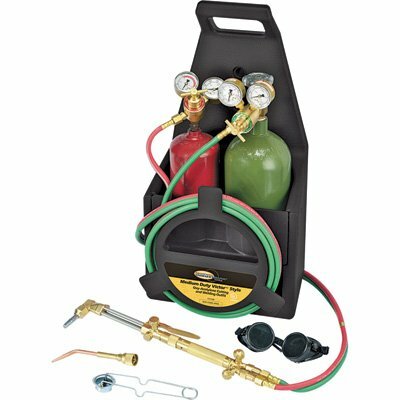 This portable welding torch kit comes with the following: welding/brazing tips, welding handle with front valves, oxygen regulator with rubber gauge boots, acetylene regulator with rubber gauge boots, rear inlet connection, twin hose, welding goggles, tank key and a security chain, carrying stand that has a storage compartment for smaller parts. The main thing users didn’t like about this unit is that you have to buy the tanks separately. This Arksen portable welding torch kit is good for welding pipes, tubes and a variety of other metal repair work. Users like how lightweight it is and find it good for general maintenance type work. It can be used for iron or steel welding as well as braze welding, cutting, shaping and bending of metal. A nice feature a lot of users like is that the regulators are rear-entry which gives this portable welding torch kit more balance when on smaller cylinders. This portable welding kit has a cutting capacity of ½ inch and a welding capacity of 3/16 inch. 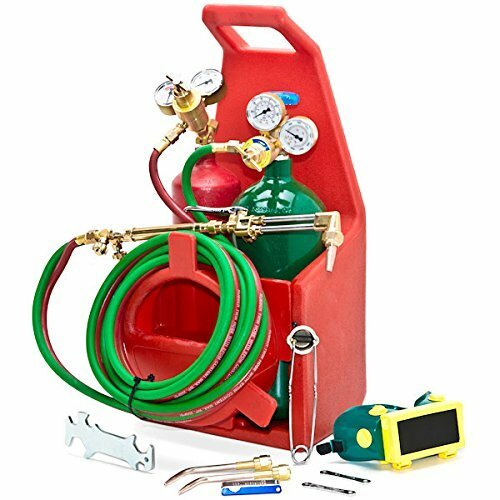 It comes with its own cylinders for oxygen and acetylene, has both an oxygen and an acetylene regulator, cutting nozzle, cutting attachment, twin welding hose, a tip cleaner, carrying tote and welding goggles. Some users have discovered in some areas you can’t get the tanks filled and the couplings on the hoses don’t get tight enough. They also complained that this portable welding torch kit does not come with instructions. Welding and cutting torches, and other types of welding supplies, are types of mechanical tools that are designed to combine a gas fuel with oxygen using an open flame so that metal can be melted together in a tight seam. Generally, welding torches, as well as their portable varieties, are comprised of a metal stem bent at a angle allowing the welder to direct it where he wants to weld. Sometimes professional welders purchase fume extractors and used together to eliminate air-borne toxins. The controlled flame that the welding torches possess at the end of the stem is an incredibly hot flame able to melt a variety of different metals including aluminum, steel and tin. These high-powered, portable welding cutting torches will be able to fuse two pieces of metal within seconds, creating a strong bond that is essential for industry use in a variety of different settings including shipbuilding, plumbing, art sculptures, automobile manufacture, home repair and essentially any sort of heavy industry where metalworking is required. Oxy-fuel welding is also known as oxygen acetylene welding and oxy-fuel cutting. There is a difference between oxy-fuel welding and oxy-fuel cutting, in the former the welding tool is designed to weld metals, which means that the two pieces are heated until they share a molten metal pool. And the latter, the welding torch uses a process of oxygen streaming onto the metal that burns it into a type of metal oxide flowing out the kerf as a sort of slag. Typically these portable welding kits are comprised of a regulator, I guess who's, a non-return valve, check valve, a cutting torch which can be of the rose, injector or welding variety. If you are looking to purchase a portable welding torch kit, check out our reviews on this page, examine our comparison table to get a sense of the best welding options on the market today, and also check out individual product pages because there are lively discussions there concerning the quality of the different devices available for purchase. While these might not be welding kits for everyone, they are powerful welding kits for service professionals that need a mobile welding option for air conditioner repairs, going on site to conduct automotive and vehicle maintenance, even for artists working with metal sculptures that need a portable and mobile welding torch solution.